Princess Leia Issue 1 of 5 Cover. Marvel’s latest comic transmission from a galaxy far, far away has finally landed on comic store shelves- It’s Princess Leia #1! Written by Mark Waid, with Art by Terry Dodson and Inks by Rachel Dodson, this issue ushers in a short but exciting run for this 5-part miniseries that is not to be missed. Princess Leia Issue #1 [of 5] Cover. Fans of the space opera may be feeling understandably inundated with titles from Marvel’s reclaimed Star Wars comic properties, with this series coming on the heels of the ongoing Star Wars and Darth Vader titles, preceding the upcoming Kanan: The Last Padawan series. Leia’s story, though destined to be short-lived, will be memorable for sure and a standout among the group. If this first issue proves anything, it’s that there is a rich, unexplored lore surrounding her rebel highness following the destruction of her homeworld Alderaan. In the wake of the Battle of Yavin, we see little time for celebration or mourning from the rebellion, as plans must be made to relocate the rogue forces as they prepare to further combat the Imperial Empire. Leia, at the head of this rebellion, must balance politics with personal affairs as she finds her place among the legions standing up to Darth Vader and his sinister allies. This isn’t to say she has to do it alone, though. This comic takes place in between Episodes IV and V of the cinematic universe, and of course features familiar faces such as Luke, Han and Chewie, Artoo and Threepio, and even Admiral Ackbar. All of them take a back seat to the strong-willed princess who does everything in her power to ensure the success of the rebellion. She awards medals of bravery to those who helped thwart the Death Star’s evil plans, but there is not much of an opportunity for the rebel legion to revel in their victory. What about the devastating loss of Leia’s homeworld? Apparently she wasn’t the only one affected by the fatal blow- she meets fellow a Alderaanian and ardent royalist Evaan, who is a squadron pilot for the rebellion. She is determined to stay true to her Alderaanian heritage even when she feels that the princess isn’t fulfilling her duties. Together, though, the women resolve to protect the remaining, scattered children of Alderaan from the Empire. Leia, tired of being asked to sit back and deal with the politics of the rebellion rather than the action, enlists Evaan’s help with her latest scheme. Throw in some droid double-crossing and rogue pilot racing, and this book’s energy takes off in hyperdrive. If there is a Bechdel test for comic books, this issue passes with flying colors. Not to mention it features two female characters- more than most Star Wars media can boast- working together for their own personal beliefs while also fighting to protect the galaxy from the clutches of the nefarious Sith lord. First stop on their epic journey? Naboo. Princess Leia will travel from the rebel base Yavin to her birth-mother’s planet in search of the children of her own lost world. I’m so in love with this book already. I’ve enjoyed the other initial Star Wars launch titles, but this book really sells the lot for me. It deepens the mythos between the films and gives Princess Leia a much deserved spotlight. Waid’s writing is very cinematic and entertaining, and Dodson’s artistic stylings add a gorgeous visual experience that conveys the regality of the princess as well as the awesome action of what it takes to lead a rebellion. If anything, his characters can tend to meld together, the men having similar facial structures and physiques, the women similarly sharing features and shapes. However, the artwork is so beautiful and works well to enhance the experience of the book as a whole. Being a 5-part miniseries, I highly recommend you pick up this first issue and contact your local store about subscribing to the whole series. This title, while inhabiting the same beloved world of the Star Wars universe, offers a vastly different, unique adventure from one of the most poised and powerful science fiction women to date. 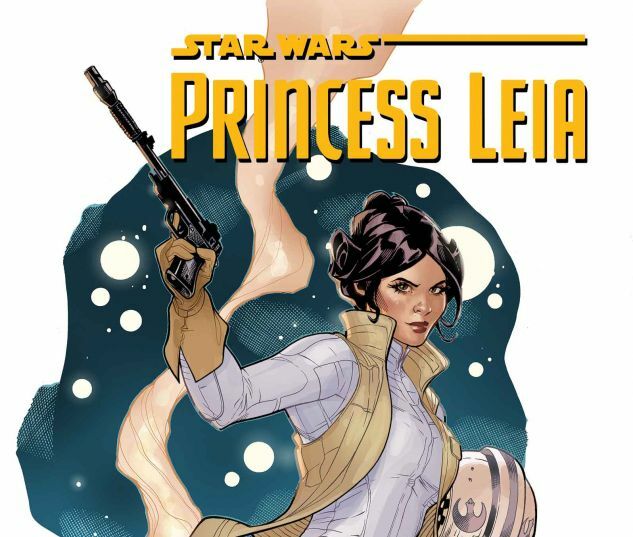 Princess Leia #1 wows and delights and surpasses all expectations I held for it- I have no doubt Waid and Dodson will continue to keep up the energy for the duration of the story. I’d just as soon kiss a Wookie as letting this wonderful series pass me by! Disclosure- I have no material connection to this comic book and did not receive a review copy.